Obituary for Flora Mae (Young) Baker | Cromes-Edwards Funeral Home & Crematory, Inc.
FLORA MAE BAKER, age 83 of Maplewood, passed away Tuesday, January 22, 2019 at 12:48 PM at St. Rita's Medical Center in Lima. She was born on November 2, 1935 in Bellefontaine, Ohio, the daughter of the late Leroy and Mildred (Brackney) Young. On August 4, 1953 Flora Mae married Lloyd C. Baker who survives along with their four children, Karen DeWitt of Cincinnati, Candace Baker of York, SC, Gregory D. Baker of Jackson Center, and Cheryl (Fred) Pulfer of Anna, one brother, Robert (Sharon) Young of Clyde, OH, six grandchildren, Jennifer, Carrie, Jill, Kyle, Leslie, and Rebecca, and 11 great-grandchildren with two on the way. Mrs. Baker was a 1953 Sidney High School graduate. She retired as a purchasing agent for Airstream Inc. in Jackson Center. 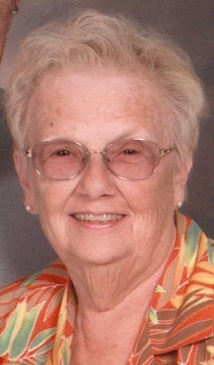 She was a member of Maplewood United Methodist Church, Maplewood Grange, 4H Club, and United Methodist Women. Funeral Services will be held Saturday, January 26, 2019 at 10:00 AM at Cromes-Edwards Funeral Home, 302 S. Main Ave, Sidney, with Pastor Michael Mitchell officiating. Burial will follow at Glen Cemetery in Port Jefferson. The family will receive friends on Friday from 4 to 7 PM.